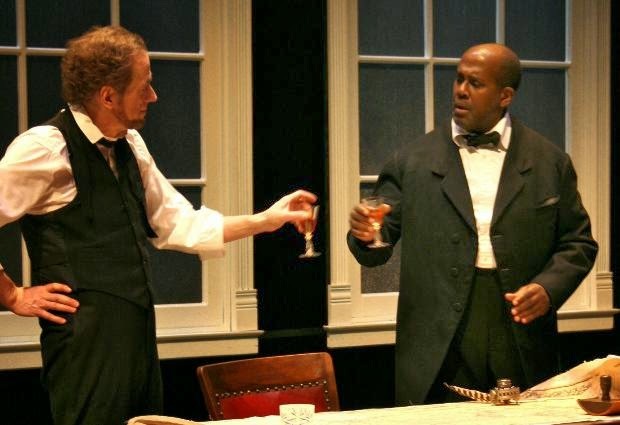 Like the last play I saw in the Guthrie studio, the new play Abe Lincoln and Uncle Tom in the White House, written and directed by Carlyle Brown, is an imagined conversation between two men in history (or in this case, literature). On the eve of signing the Emancipation Proclamation, Lincoln receives a visit in his White House office from the fictional character Uncle Tom from Harriet Beecher Stowe's novel Uncle Tom's Cabin, written in 1852 as a protest against slavery. Abe and Tom discuss slavery and what its end would mean, as well as issues of grief, loss, and faith. It's a fascinating new way to look at an age-old issue - the continuing effect of slavery on this country. Although the phrase "Uncle Tom" has a negative connotation today as a submissive black man, at the time the book was published Uncle Tom was seen as "a noble hero and praiseworthy person." That is the version of Uncle Tom we see in this play, as he encourages Lincoln to sign the Proclamation, despite his doubts about what it will achieve. It feels like a real conversation between two equals who understand and respect each other. The two men are interrupted by Lincoln's grieving wife and her seamstress/confidante Elizabeth, showing Lincoln's human side as he continues to grieve his son and try to comfort his wife in her grief. This four-person cast is stellar, each one well-suited to their role. Steve Hendrickson is a most excellent Lincoln; he's just how we imagine him to be, with the weight of the world on his shoulders. James A. Williams is his equal as he conveys Tom's confusion at how he ended up here, as well as his strong faith and human dignity that allow him to survive. India Gurley has the least developed role as Elizabeth, but she's there to support her friend. Last but not least, Jodi Kellogg is outstanding as the fragile Mrs. Lincoln, all raw nerves and desperation as she tries to make sense of what her life has become. The look of the president's White House office is efficiently achieved with just a few set pieces. Three large white frame windows hang in mid-air to represent one wall, with grand white doors opposite them. Just a desk, sofa, and two chairs adorn the space along with a few rugs (set design by Joseph Stanley). 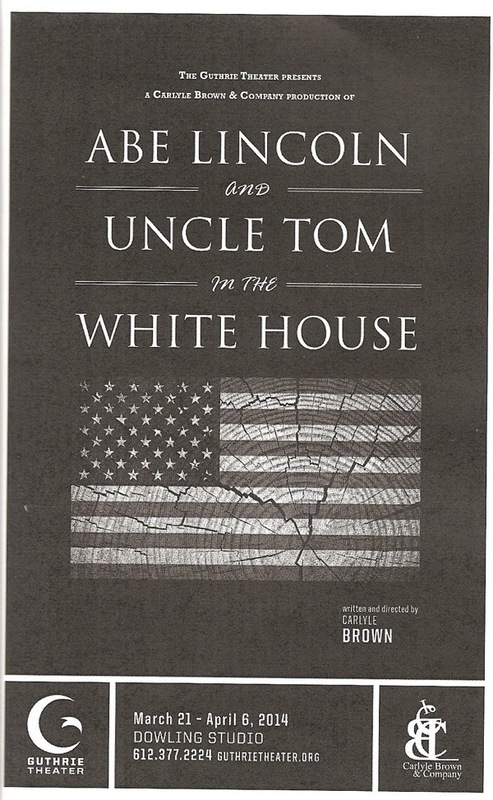 This brief look into the life of Lincoln, a president we know so well, and Uncle Tom, a fictional character we think we know so well, offers a fresh perspective and an opportunity to explore some important issues in a new way. I've never read Uncle Tom's Cabin but I'm now intrigued, and might have to pick it up sometime. In the meantime, you can visit Abe Lincoln and Uncle Tom in the White House in the Guthrie's Dowling Studio from now through April 6.